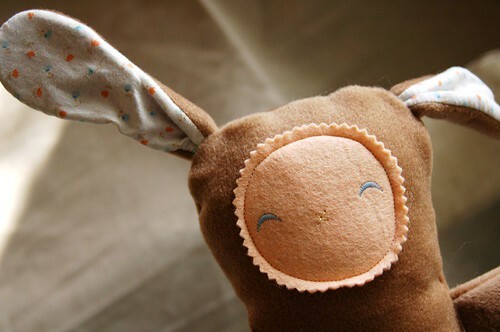 special easter edition oobees now in my shop! i whipped up these little fellas last weekend while i was waiting for the carpet cleaners to come by and erase all evidence that we live like pigs before my mom came to visit, along with two from the grey and cream cut velvet that i made this guy from. 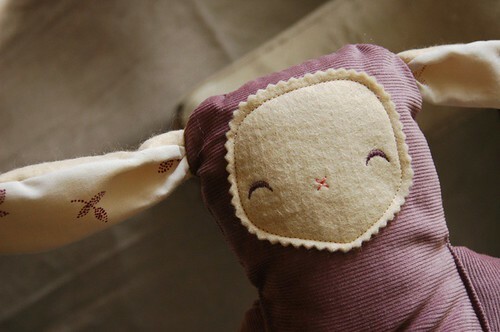 i have two more bunnies that just need final touches and should hit the shop in the next few days. When you move over here I am so buying one of these oobies for Mahlie! Perhaps we can trade for a doggie... Don't worry about flickr mail - I understand it's time consuming being a tour guide and having a house guest! I've so lost touch with onegirldesign! I'm so glad I found you again from Bloesom, I remember your blue and white themed website, and was sorry that I didn't hear anything since you moved to oz! Yay! your holidays sound loooove-ly. And much needed! Sweet little oobees too.